The Chilean rider, crowned FIM Cross Country World Champion in October, this year rides with the hopes of the South American rally fans and is aiming to improve on his podium third place from the 2016 edition. He is committed to stay in close touch with the lead riders throughout this two-week long epic and above all to deliver consistent results. Quintanilla also has something of a ‘home’ advantage in an edition of the rally that sees riders competing at altitudes above 3500 meters throughout the first week, and in extremes of temperatures. The first two days have been hot and humid as they traveled from Asuncion in Paraguay into the north or Argentina. On Tuesday they headed west from Resistencia to San Miguel de Tucuman, a total distance of 803km, of which 275 km was the timed special. Once in the clear and riding alone, Quintanilla turned up the gas after the third checkpoint and came home in sixth in the stage and overall. 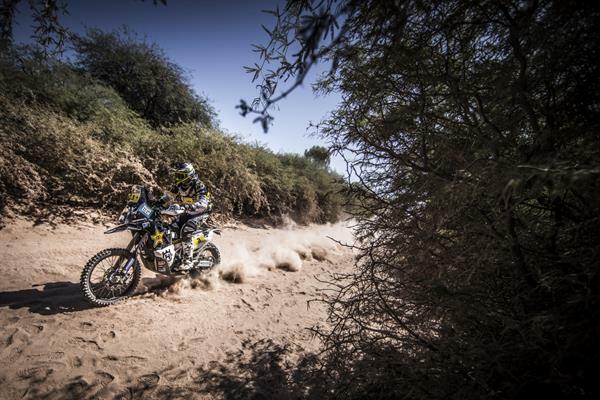 Rockstar Energy Husqvarna’s Pela Renet, contesting his second Dakar Rally finished the stage in 21st position with a deficit of 12.27 minutes. He maintains the same position overall and is currently 13.09 minutes off the leading time.